A way too cute title—I agree. But LUTs are indeed everywhere. Before we look at the ways LUTs are used, let’s be sure we understand what a LUT does. LUT stands for "Look Up Table." Those who program computers are familiar with lookup tables. Here is a simple example of lookup table use. Assume there is a need to find the phone number from a street address. Once an address is available—as a string of characters—the string is, by character, one by one compared to strings held in the table. When a match is found, the associated phone is grabbed and made available. The task can, of course, be reversed. In this case, a phone number is compared, by numbers one by one, with phone numbers in the table. When a match is found, software grabs the associated address and it is made available. This process is called “reverse lookup.” This is an example, of a LUT where each row contains two values. As we will learn, a LUT may also have a single value per row. 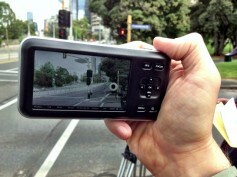 The first time I encountered a LUT was when I reviewed the Panasonic AJ-HDX2700 VariCam. The HDX2700 offers seven shooting gammas as enumerated in Figure 1. Figure 1: AJ-HDX2700 VariCam shooting gammas. When the AJ-HDX2700 is switched to FILM-REC the image looks completely wrong on HD monitors. Monitors, of course, are designed to meet BT709 gamma specifications. When editors saw HDX2700 footage, much like in the early days of shooting using log gamma, the “poorly shot” footage was a major distraction to logging and editing. How could one decide which shot to use when both looked washed-out? Panasonic solved the problem by including a LUT within the monitor that converts FILM-REC video to BT709. Problem solved. Those who watch with the LUT enabled see video that looked as they expect, yet the video itself retained its flat-look right up until it was printed to film. Now that we’ve seen the way a LUT can be used, let’s look at a highly simplified version of how a LUT works. Figure 2 graphs three signals. Beginning with a linear signal (blue), a LUT has been applied to yield a curved response (green). For example, this LUT has 65,536 rows. The rows contain values that have been computed as the logarithm of values from zero to 65,535. Figure 2: LUT used to convert linear to log and back (ignore red/green arrows). 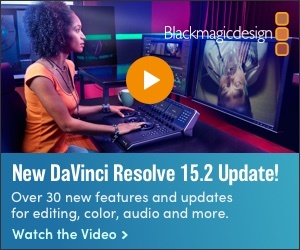 When cameras such as those from Blackmagic Design, which support log, were first released it was necessary to provide a viewing option for the shooter. Figure 3 shows the company’s Pocket Cinema Camera. The LCD viewing screen is like that of any smartphone. In many cases, the screen will be at least partially washed-out by ambient light. When a low-contrast log gamma image is presented on the screen, it is very hard to discern its composition making focus difficult. Figure 3: Pocket Cinema Camera LCD washed-out in bright light. The solution—incorporate a LUT that converts log gamma to BT709 and send it to the LCD screen. The log signal is recorded to ProRes 422 for later grading back to BT709. Now let’s return to how a LUT works. Each pixel has RGB values, after the contents of a Bayer sensor have been deBayered. Each pixel in a signal consists of three values. Assuming the three values track each other over the signal range from zero to 65,535—the same LUT can be used for each of the RGB components. A LUT that will be applied to all three signal components is called a 1D LUT as shown in Figure 4. A 1D LUT is applied successively to the three video components. Figure 4: 1D LUT applied successively to RGB components. When a LUT is created for real-world use, the RGB signals often don’t track so closely that a 1D LUT can be used. Therefore, it is more common to encounter 3D LUTs as shown by Figure 5. Figure 5: A 3D LUT contains three values for each RGB pixel. The 3D LUT shown by Figure 6 can be used to modify a signal where the Red and Green components track, but the Blue component does not. Therefore, as shown by Figure 6, the pre-computed values are entered into the Blue section of the 3D LUT are nonlinear. Figure 6: A 3D LUT has three pre-computed values for each row. It’s common to represent a 3D LUT as a cube (Figure 7). Each axis represents one of the RGB signal components. Figure 7: A 3D LUT represented as a cube. Figure 8 shows a fancy vision of a LUT cube. It shows an RGB value that lies at the intersection of the three axes. What good a picture like that will do for you escapes me. That’s because although you can create your own LUT, in most cases a LUT, or LUTs, will be supplied by either your camera’s manufacturer or you’ll download one based upon a descriptive name. For example, Warm Southern Cali Look. Figure 8: A Perspective View of a 3D LUT. Typically, a 3D LUT name will have a .cube extension. Figure 9 presents a partial list of LUTs that I use with DaVinci Resolve. I used the two LUTs in the JVC folder when I reviewed the JVC GY-LS300 camcorder. The two-part series of articles are available here: Field Report: JVC GY-LS300 and Field Report: JVC GY-LS300 Working with J-Log - Part 2. Figure 9: Some LUTs I use with DaVinci Resolve. FCPX users have multiple options for employing LUTs. There is LUT Buddy, mLUT, and my favorite—the LUT function that comes with Color Finale Pro. Unlike the two others, which are free, the advantage of Color Finale is during the edit phase LUTs can be used (Figure 10). When your edit is finished, LUTs are disabled and grading can be accomplished using Finale’s grading tools (Figure 11). Figure 10: Color Finale Pro LUT utility. Figure 11: Color Finale Pro color-wheel grading panel. By far the most common LUT usage is to create “looks” on either un-graded or graded video. Figure 12 show a set of LUTs used for this purpose. In this case, all the LUTs emulate film stock—minus grain of course. Figure 12: Some LUTs that emulate film stock. Creating the look of a particular film stock is a classic LUT use. However, using LUTs to rapidly and very cheaply create a specific mood is likely the most popular LUT use. One can buy libraries of LUTs, each containing dozens of moods. Figure 13 shows three moods one might, or might not, want to use. Figure 13: LUTs that create moods. LUTs offer the video shooter a wide range of options when capturing, editing and for final display of content. Spend some time understanding what LUTs do and how they can improve your work.